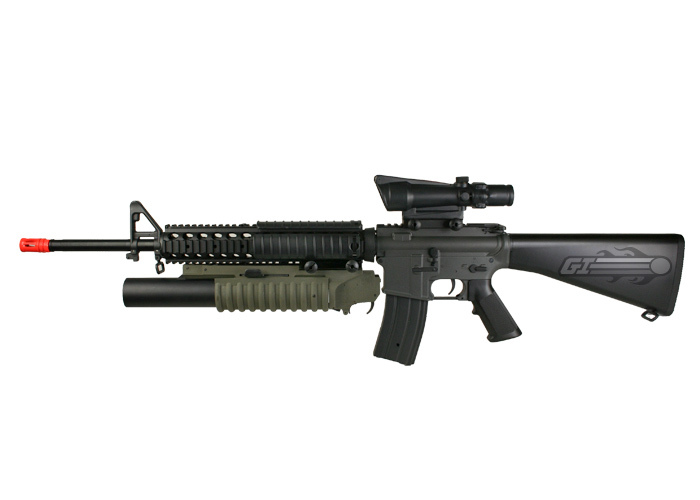 The JG M16A4 RIS is a replica of the famous assault rifle that is in use with the U.S. Marines today. 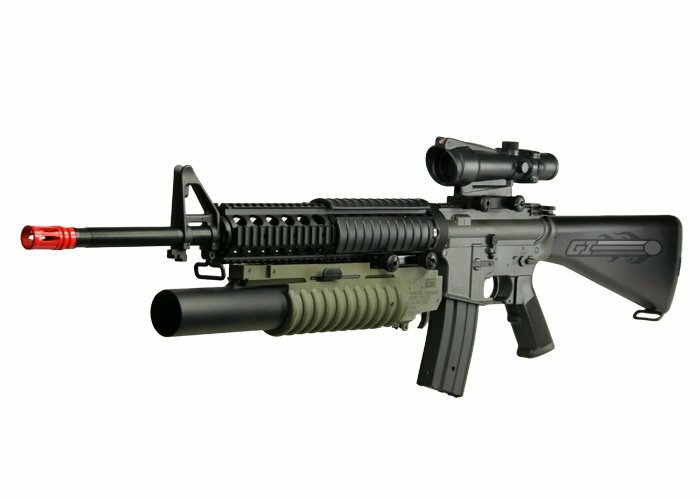 The JG M16A4 RIS is used as a designated marksmen rifle for extended ranges falling between the duties of a rifleman and a sniper. It comes with a full stock that will except most large battery packs. The working charging handle gives this gun a realistic action that even higher priced guns like CA do not have. JG AEGs are fully upgradeable and compatible with most after market external and internal parts. This airsoft gun includes a metal Standard magazine and is also compatible with other major brands of standard and high capacity after market magazines. 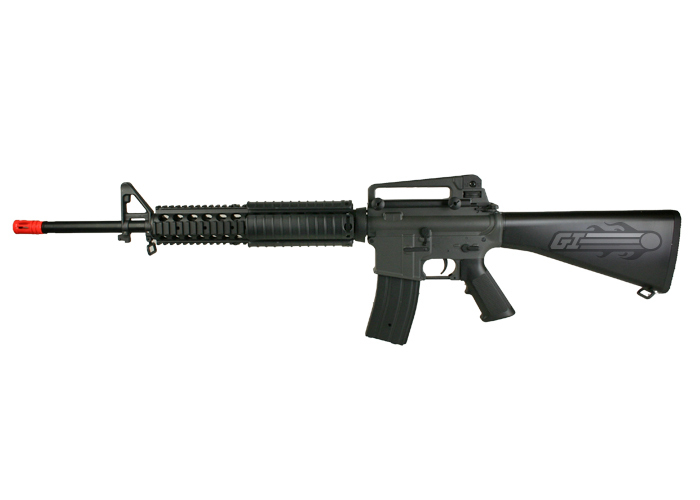 This gun is a great choice for a designated marksmen rifle to round out your squad. 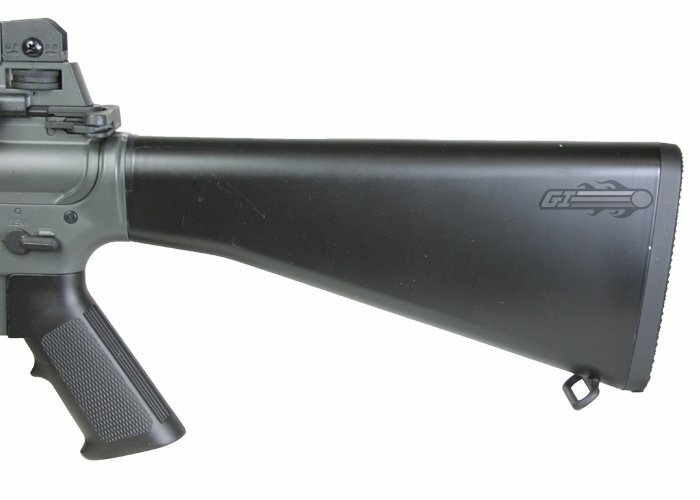 The JG Enhanced Models include a metal one piece outer barrel for increased stability. Wonderful rifle, really. Feels solid, high rate of fire, high FPS, and supports attachments. Definitely recommend. I bought this as my first airsoft rifle because of all the positive reviews and people saying that it was "such a good gun for beginners." However, I must caution against buying this gun. -Good, sturdy plastic. The only part of this gun that's full metal is the inner barrel. -Very nice iron sights. Classic M16, nothing special, but almost dead accurate. -This gun is fairly hefty. This can be good for realism purposes, but not as practical in the field. -Very long. I'd classify this more as a con (as shown below), but it's generally the biggest AR on my field. -This gun is NOT a DMR. Sure, you can upgrade it and make it one, but I wouldn't recommend it. Not worth the money. It's still a very effective gun at range although it doesn't have sniper-like precision. -Horrible, terrible internal stock design. The biggest issue with this gun by far is the shoddy electrical connections between the gearbox and the battery. I had to open the gun on 4 separate conditions to re-tape the connections. As I played, the giant battery would shake around and knock the wiring loose. I finally cut the connectors (and with the help of a friend) soldered the damn things together. -Very long bolt that runs the length of the stock wobbles. It's a constant pain and is really the only thing keeping the stock attached to the main body of the gun. -This gun is HUGE. Don't even think that you're gonna be making quick maneuvers with this beast. Let your friends clear buildings and support them from behind. There's no way you can use this gun for CQB as that would require a gearbox downgrade for the FPS; besides, the thing's far to big for close quarters in general. -The sling mounts on my gun are very loose and make a clanking noise when running. Can be fixed with a little tape. -Inner barrel curve. I have a constant right curve on my gun. I took it apart and re-aligned the gearbox. That seemed to fix most of the problem, but it still hooks ever so slightly to the right. -Battery that comes with the gun is obviously terrible. Cheap, Chinese ni-cad. It lasted for a while but I would highly recommend investing in a new battery and smart charger. -Wobbly plastic rail on the bottom of the barrel. Any foregrips attached will wobble as well. 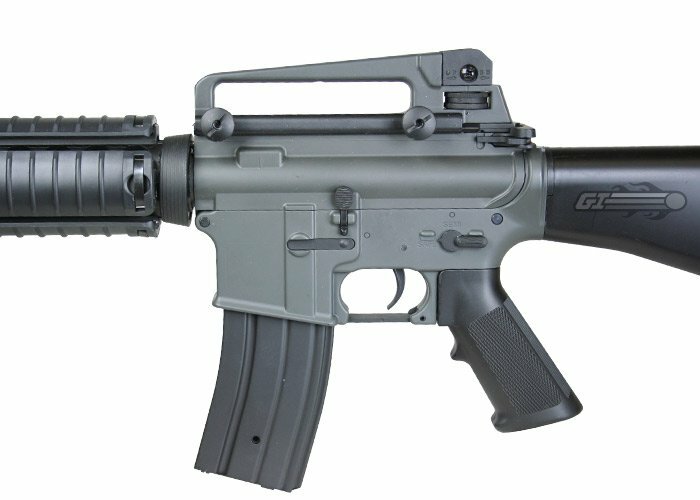 I bough this airsoft gun for the first time because I like to inmitate the one on the anime called "Golgo13" but his M16's is A2 variant though. But it ok I like to add some accessorries and optics too. Plus there is positive and negative review but I dont care(no offense). I like what bought for myself. -some minor bbs jam while in semi auto but also fix by swtiching to full auto. Are the upper and lower receiver made of metal or plastic? Are both parts of the receiver made of some high quality plastic or just metal? The receivers are polymer on this rifle. Exactly what type of Battery can this gun take? Would an 8.4v battery work? Yes an 8.4V would work just fine. Most airsoft guns have 14mm counter clockwise threading. Can I lower the FPS below 400? I love this rifle but the FPS is too high for my local Airsoft fields. The FPS limit is 400 and my rifle shoots at 430 with the required BBs. I'm not looking to replace the spring either. Would The Burst Wizard Fit Well Since The Battery Is Already A Tight Fit? Triangle sight is removable. Outer barrel length is 20in. Im looking to buy this gun and Im curious when you will have more of these available. We are currently working to get these back in stock as soon as possible. What is the ROF with a 9.6v battry? should be about 14-16 bb's per second. 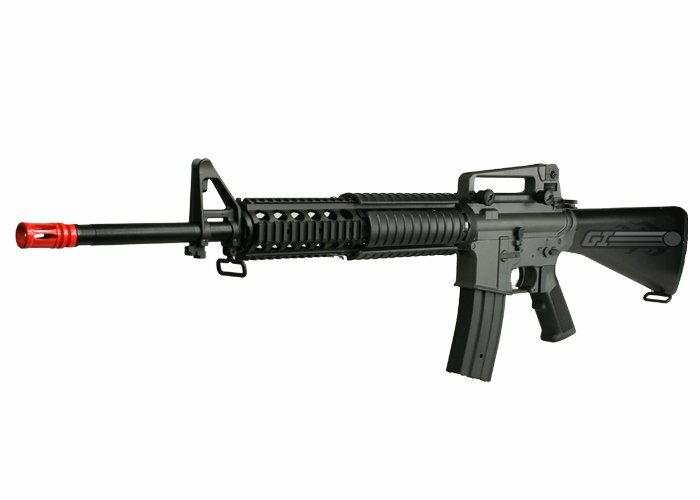 will you all be getting more of these m16a4s in stock? We are currently working to get them back in stock. 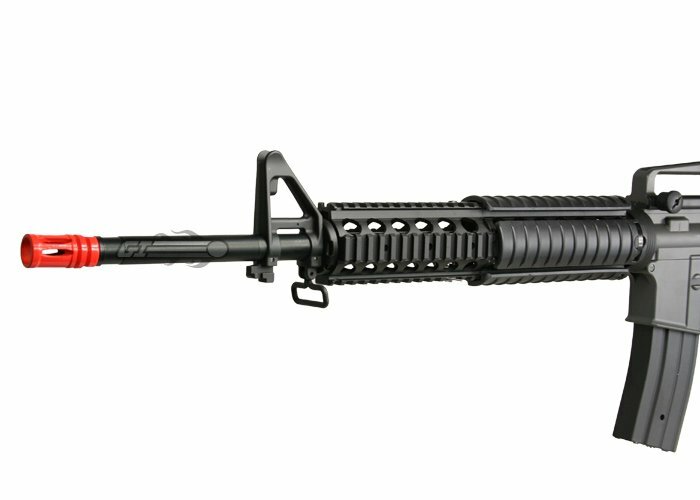 Looking to buy a barrel extension when I buy this gun Also how much would it cost to have it shimmed?. It should be able to. We just added that feature to this rifle. Is it full and semi auto? Or just Semi? Its a DMR, so i was wondering if it was full as well as semi auto. This does have semi and full auto. Length is 510mm. Inner bore should be like approx 6.08mm.